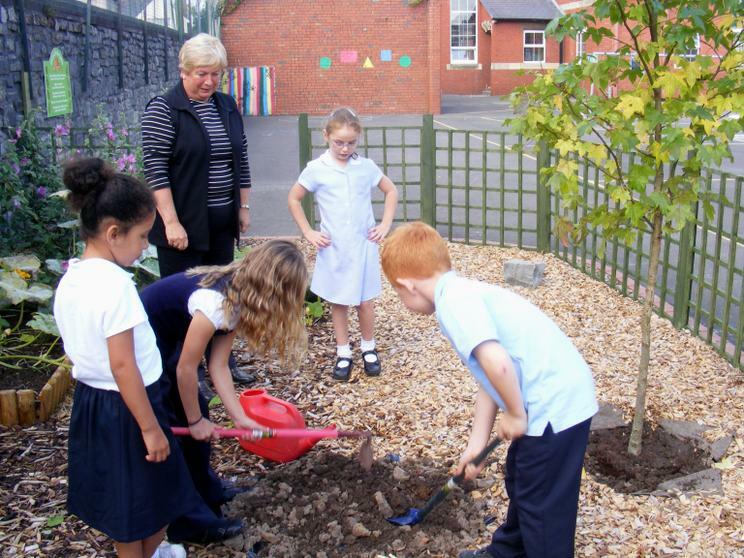 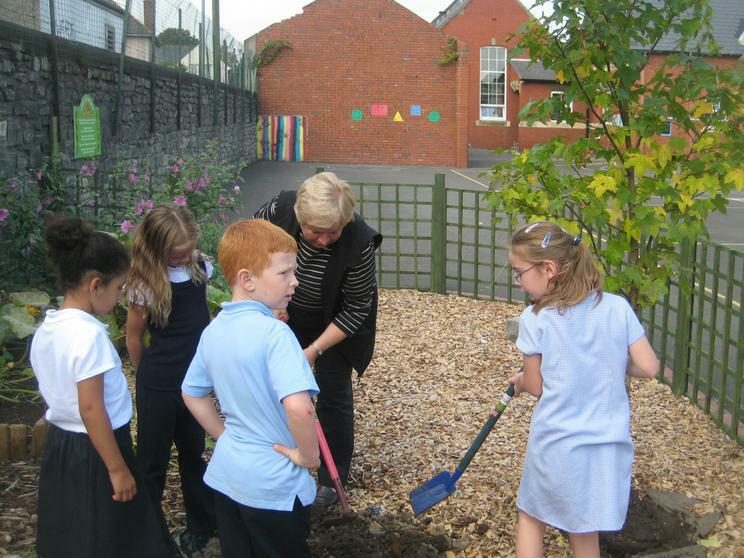 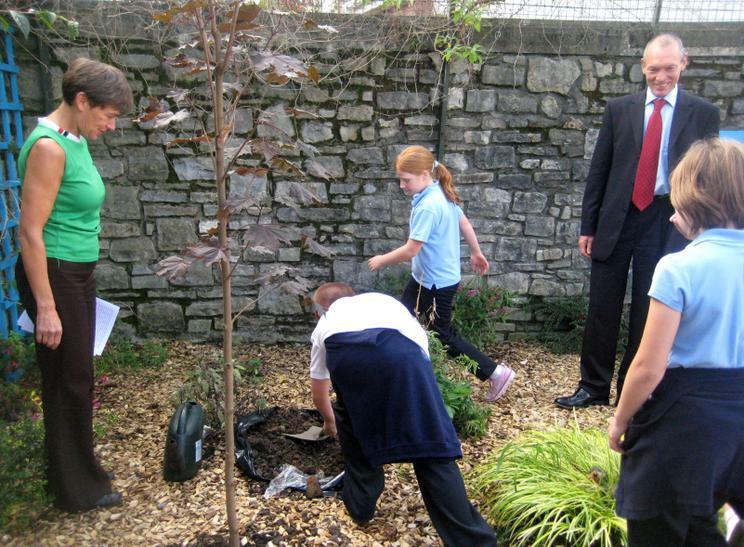 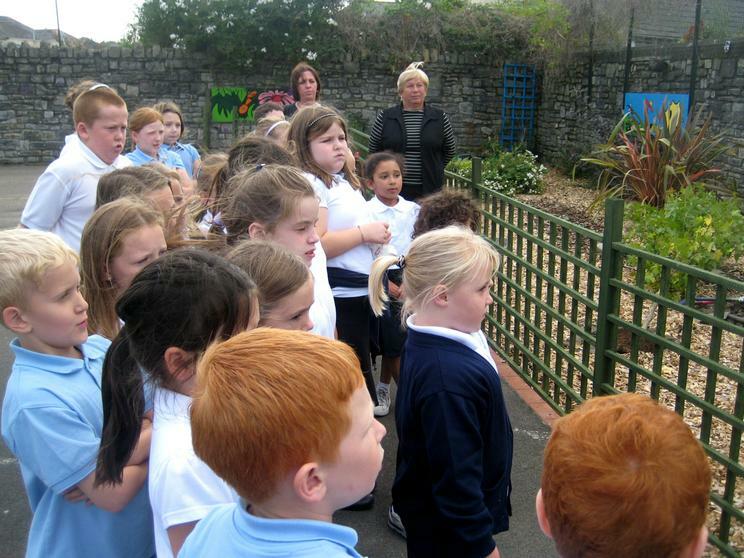 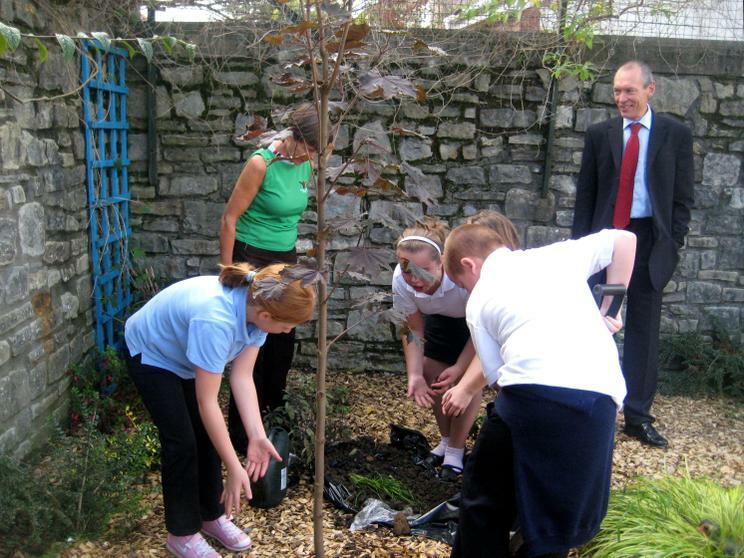 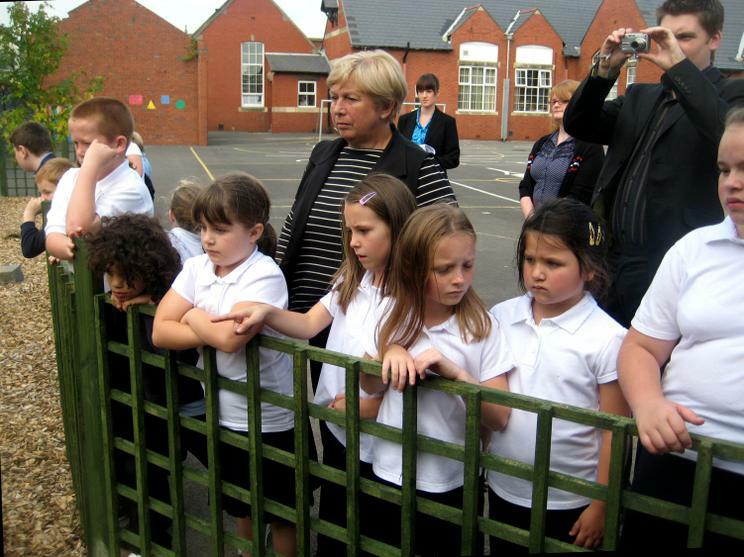 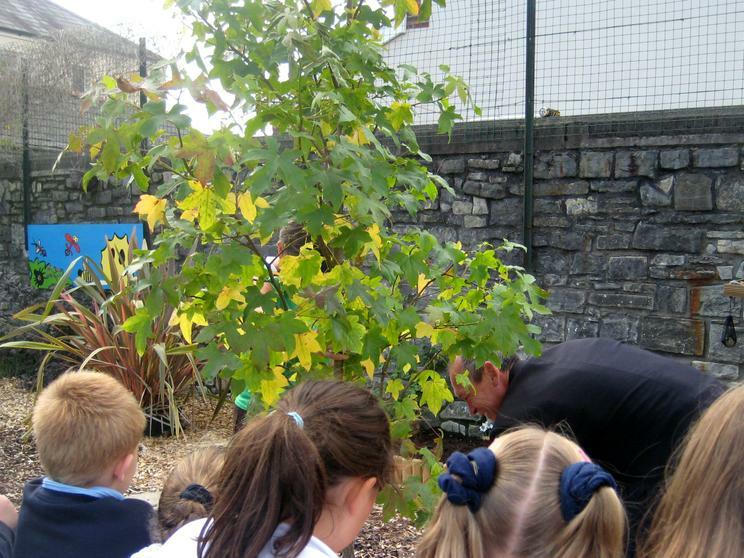 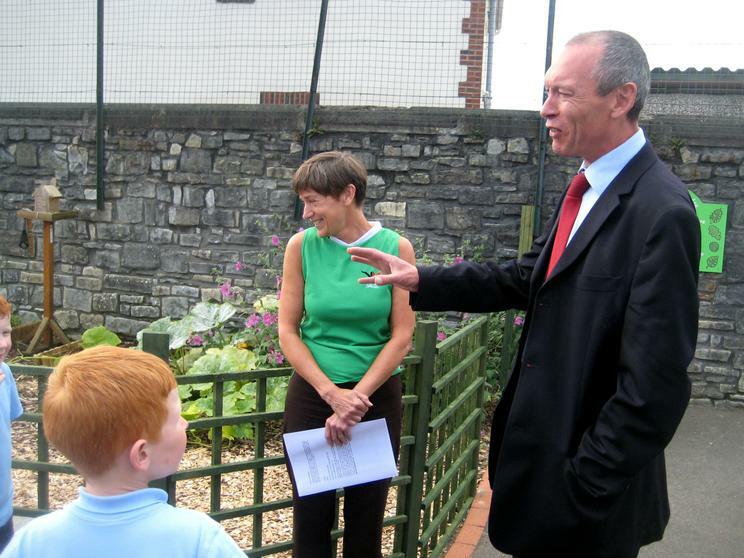 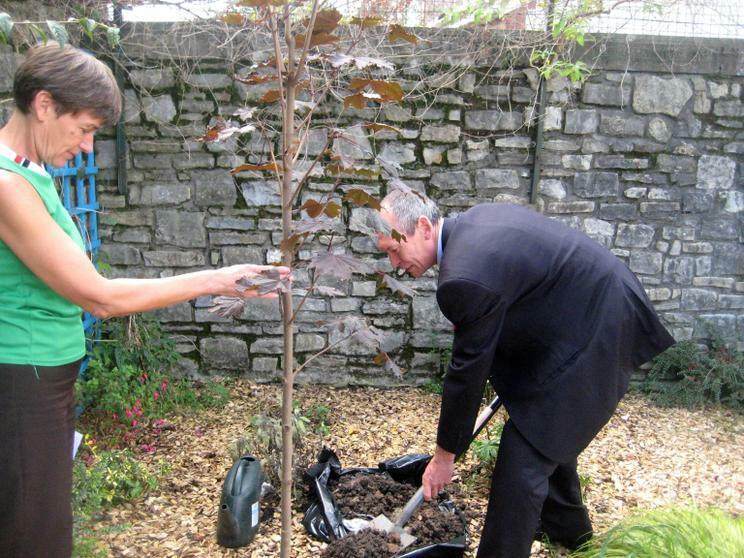 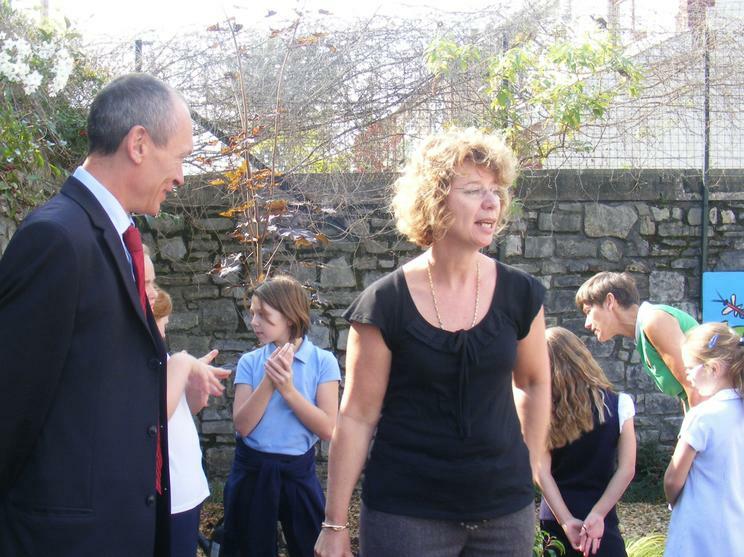 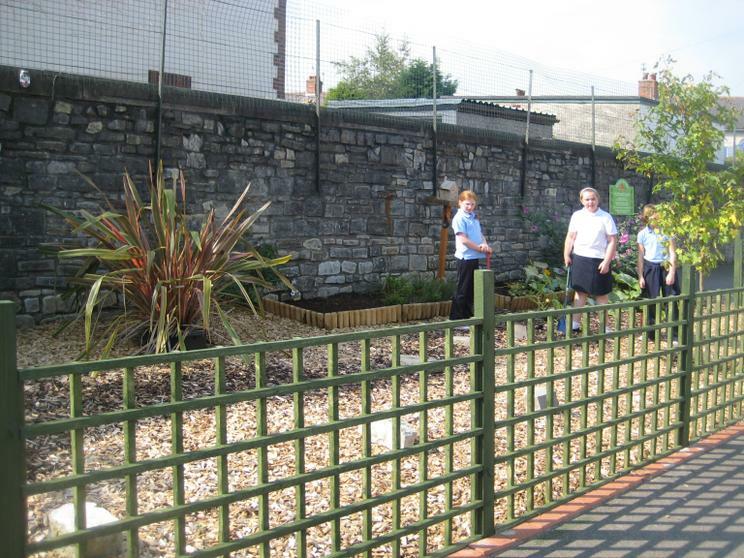 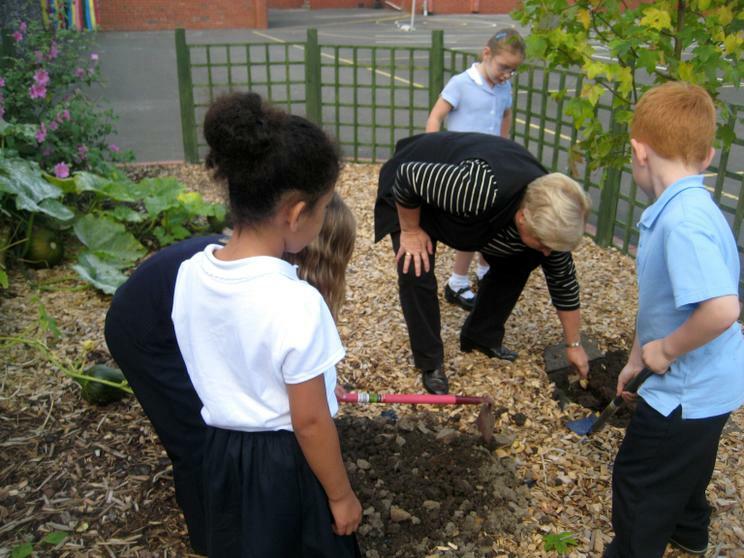 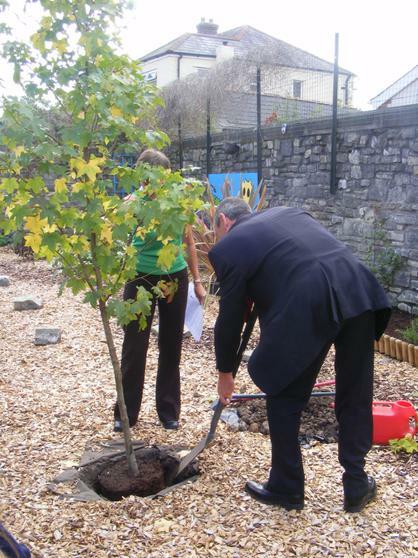 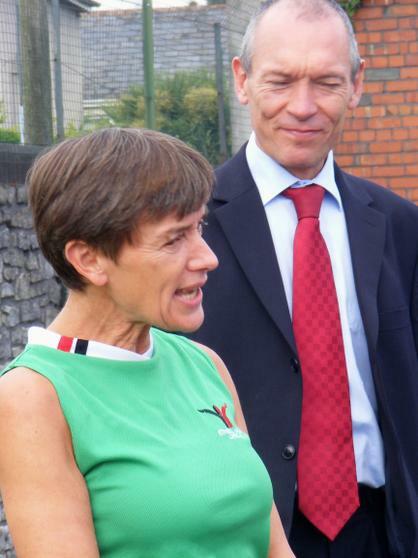 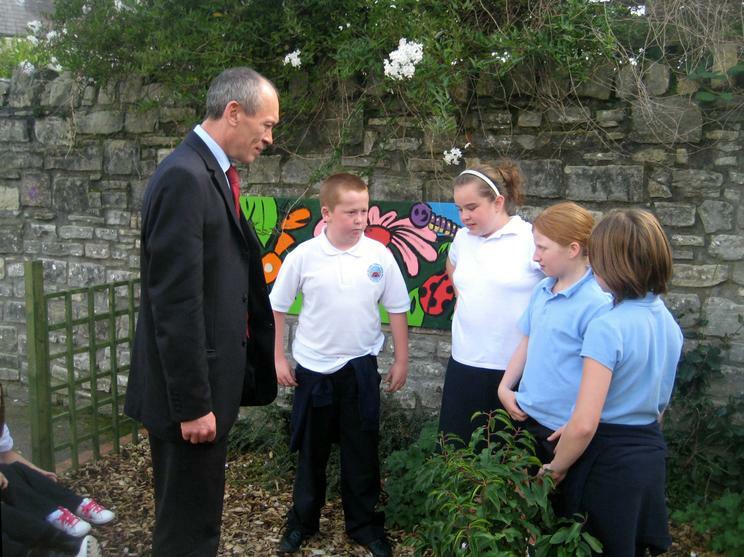 On the 22nd of September the Deputy Assembly Minister for Skills, John Griffiths came and planted two trees in our garden. 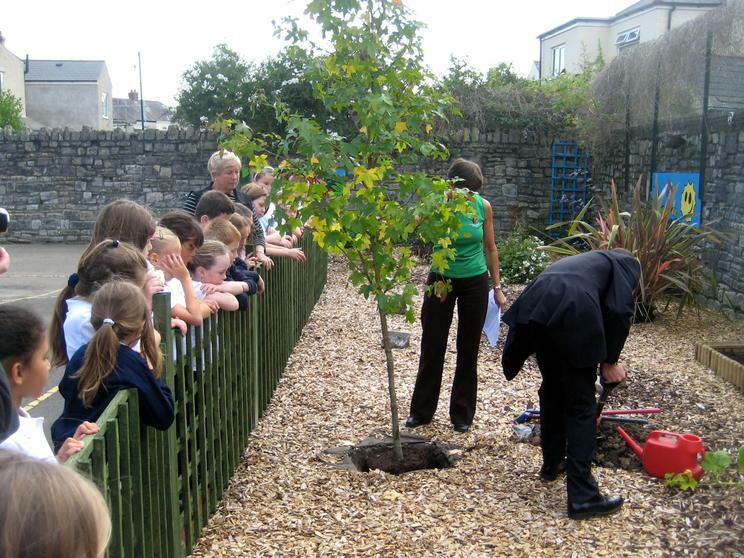 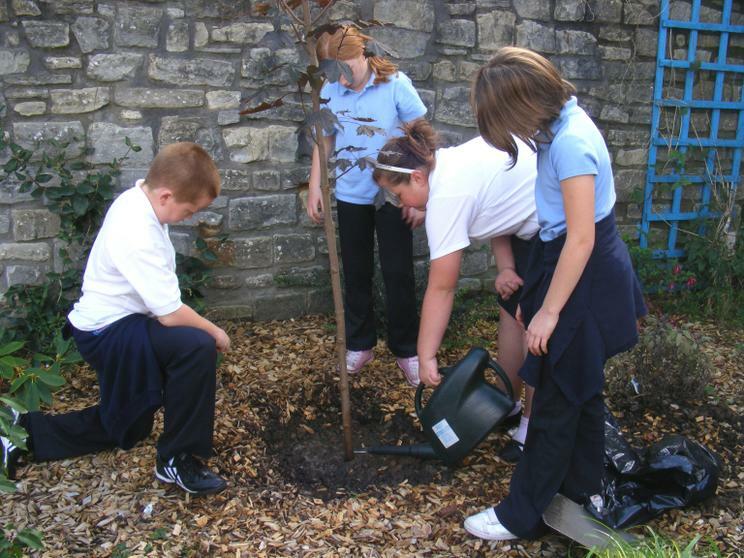 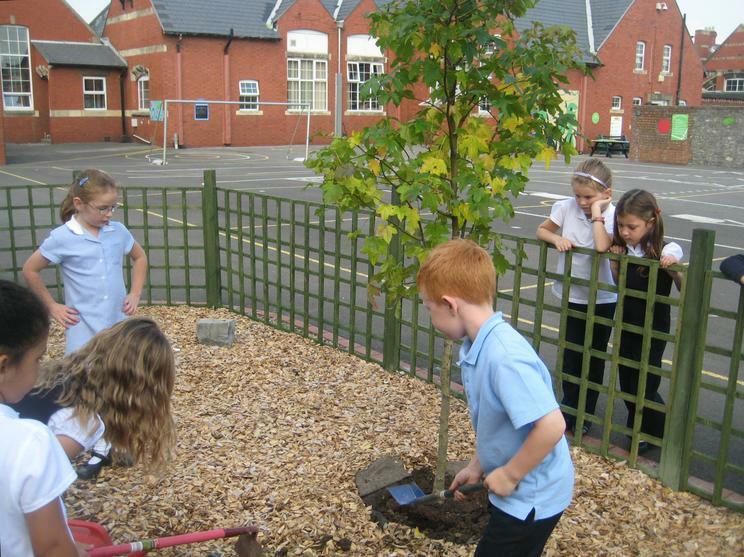 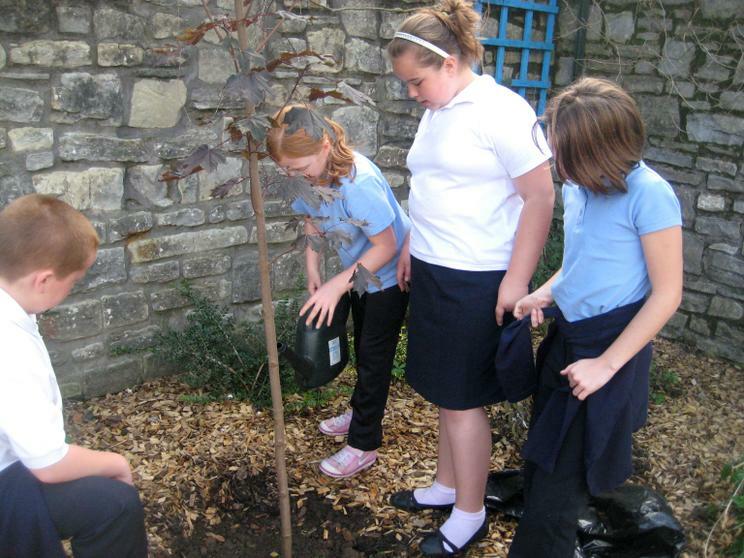 The trees were donated by our neighbours Fitness Wales who wanted to offset the CO2 their organisation produced so that they became a CO2 neutral office and planting two trees would help do this. 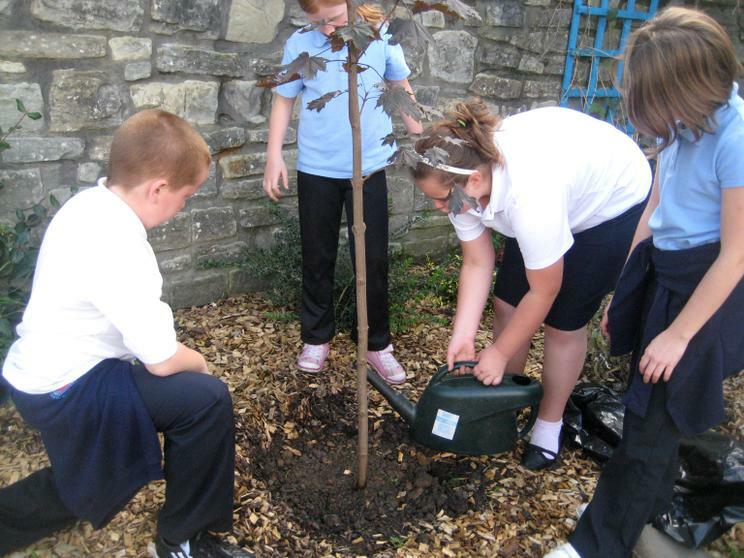 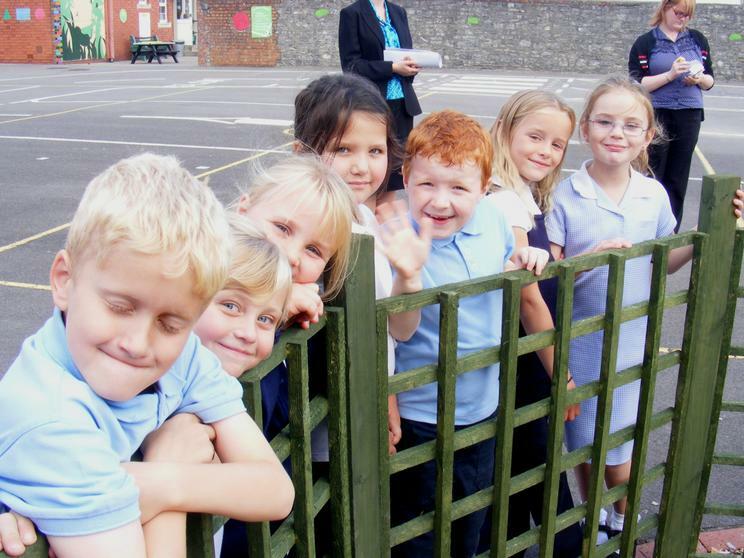 The children at Millbank all know the problems associated with Global warming and how we are all producing more CO2 than the planet can cope with. 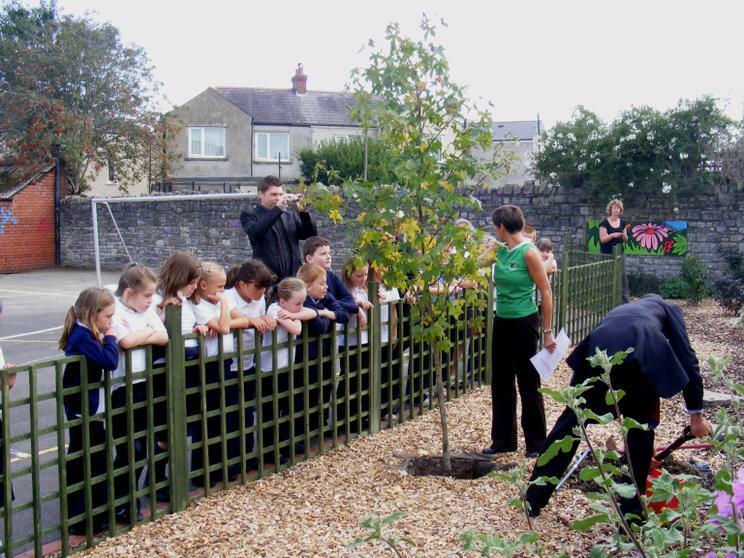 Cutting down entire rainforests which absorb CO2 and using the land for methane producing beef cattle have a great affect as does the huge volumes produced by industry. 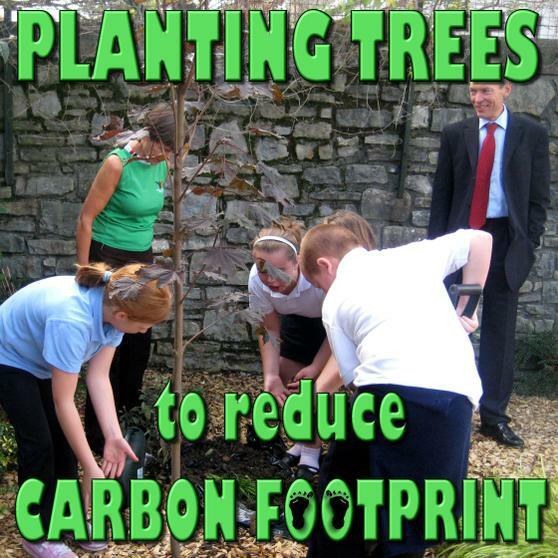 Against the millions of tonnes of CO2 gasses produced it does seem a hopeless task and that nothing you can do will halt global warming. 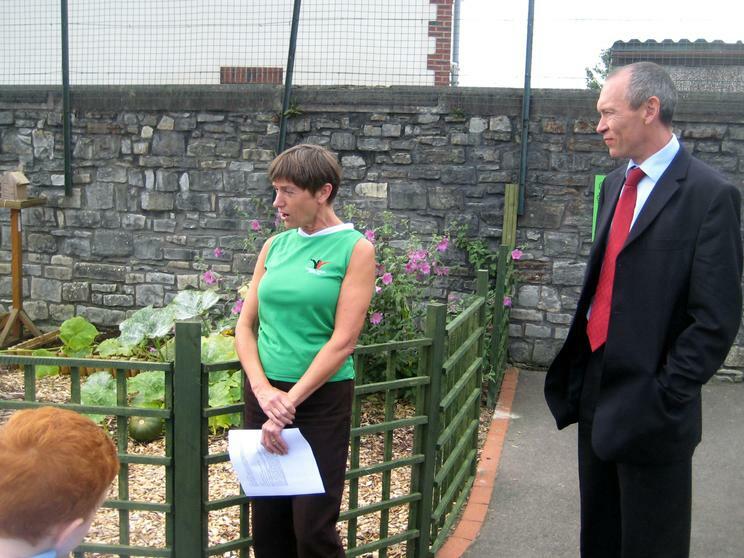 But we can every time you buy a beef burger check if the beef local and sustain ably produced -look at the labels. 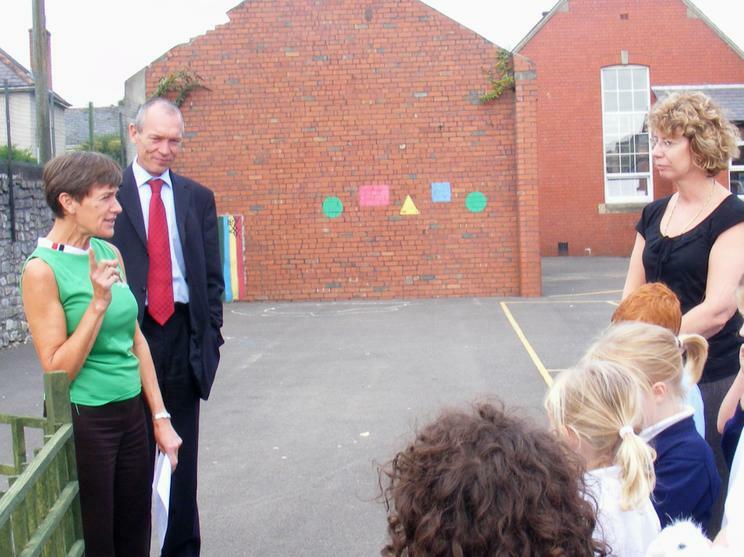 You can switch off lights and save energy so we do not need to burn as much fuel to produce electricity. 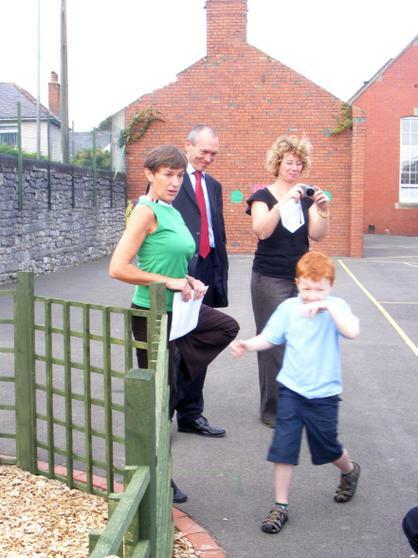 You can walk to school rather than get a lift from your mum, makes you healthier and saves energy, everything thing you do can make a difference, so make a positive one! 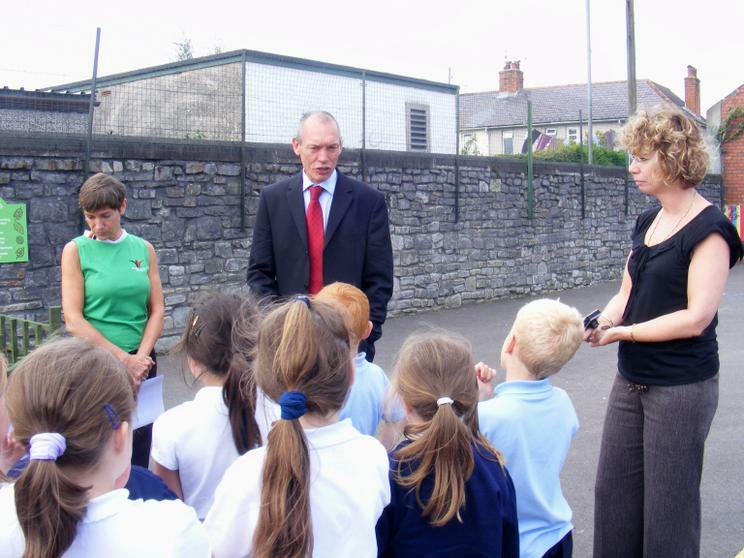 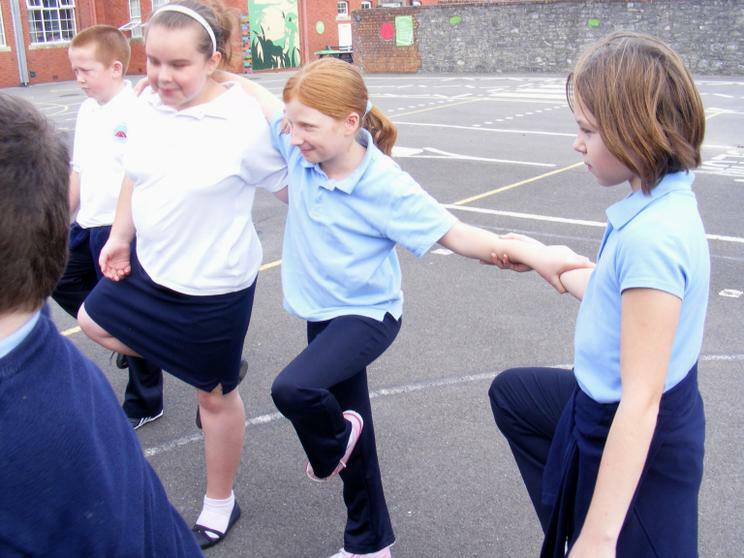 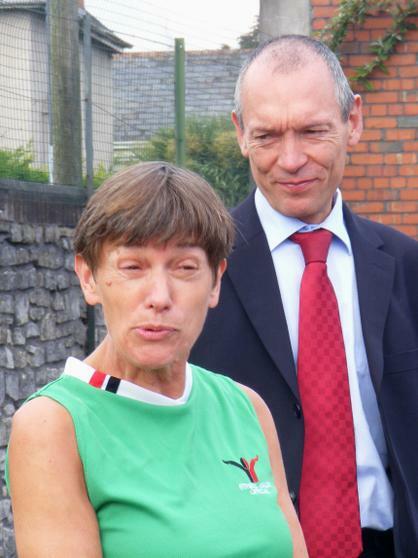 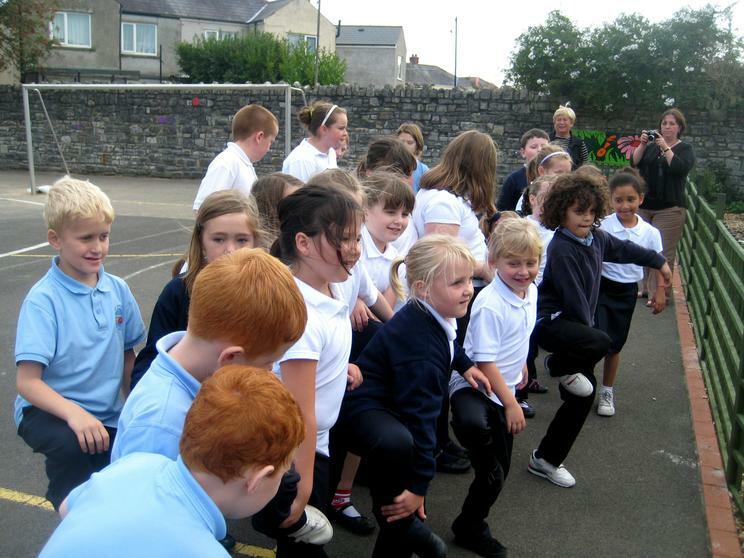 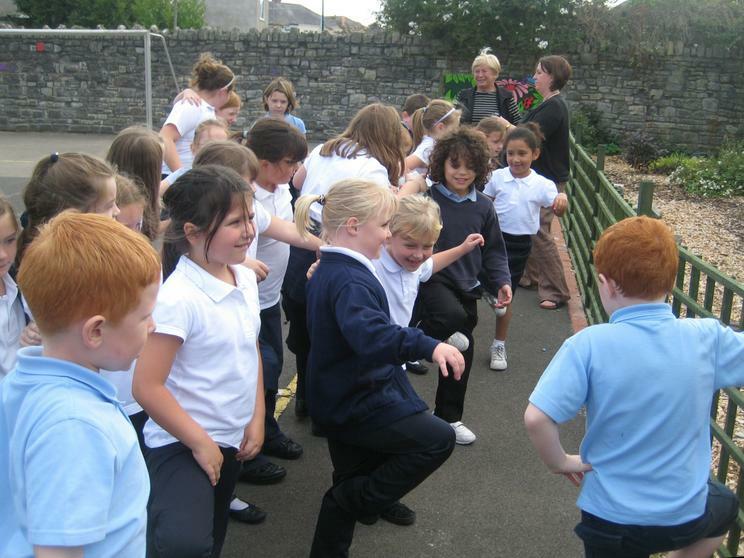 Fitness Wales are a Governing Body and training organisation, set up with the support of the Sports Council for Wales. 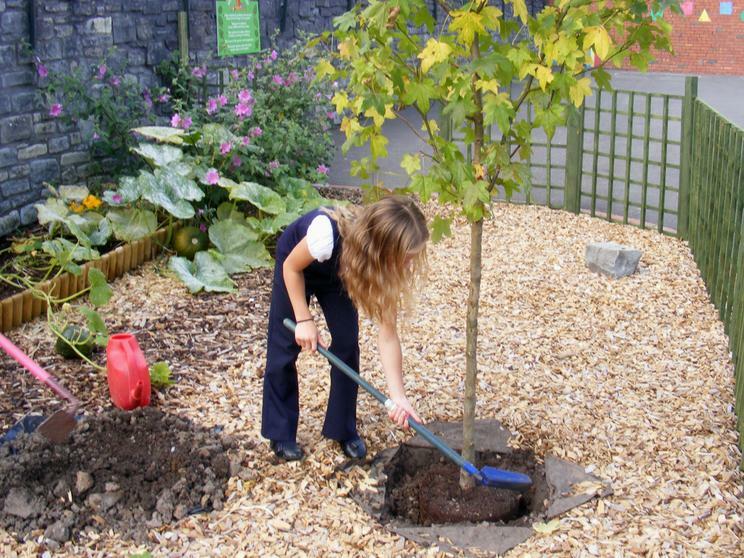 They cover the whole of Wales and rather than have a big office they have taken a sensible and practical approach using modern technology to encourage staff to work form a variety of locations around Wales, they have tried to eliminate waste and unnecessary paper work. 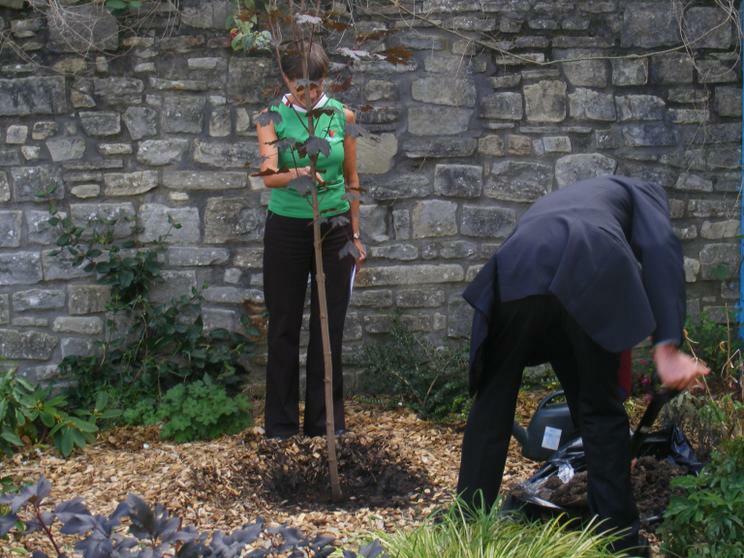 Planting trees is possible the simplest and superficial part of all the work that they have done to become carbon neutral- but we had great fun doing it.